The advantage of cloud computing on all business are recommendable that why every business either it’s a small business or larger one are moving to the cloud. It’s because cloud computing raise the efficiency of your business and helps to improve the cash flow. 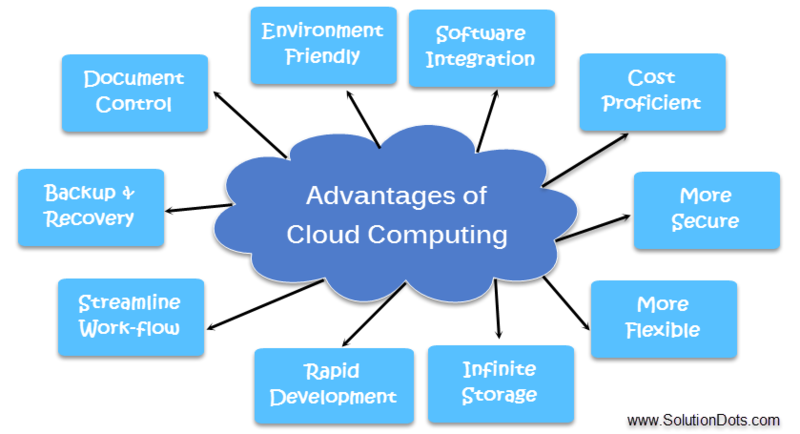 Let discuss the advantages of cloud computing one by one. The 1st most advantage of cloud computing is its proficiency in cost factors to be used, maintained and for promoted. The old fashion desktop software was so much cost consuming for the firms in the form of finance. Adding fees for against each single user was so much more expensive for business concern. On the other hand business cloud computing is so much cost proficient and available at lower rates, that significantly lower the company expenses. Cloud has raised the output, productivity, by relying on fewer tam members. It lowers the cost per unit or project factors. No need of spending too much money on hardware, software or licensing etc. The 2ndand utmost advantage of cloud computing is more security level. Before switching to the cloud firms are afraid about security issues. The Company’s data are very important so it’s your duty to know about the exact location of a company’s data on the cloud. So you should be very clear about adopting the right place for your data. Choose right service providers to save your sensitive data information over the cloud. That will responsible to keep your secret information totally secure. What Strategies Should an Enterprise Adopt in Order to Ensure Data Protection? When you put everything on the cloud it became easily accessible for anyone. It makes your company more vulnerable for external hackers’ attack and threats. Cloud computing allows all employees to be work in a flexible environment. For example, you can access information from home on vacations/leave days. These facilities provide you ease to connect from your remote location quickly. And you can easily develop a virtual office if you have an internet connection. So here we can conclude that to have flawless work flow companies should have higher bandwidth for cloud computing. According to research over the 65% companies are switching to cloud computing because of this flexibility. Your business can be scaled as up or down by your business operation, storage and management needs situations. Instead of purchasing, installing or upgrading you just need to move cloud environment. Cloud computing easily handles all these things just for you. Switching to cloud frees you from time limit and you can get for your business with ease. The most favorable advantage of cloud computing is that it can store huge amount data in contrast to desktop computers. Cloud offers a limitless storage capacity. In short, we can say that cloud has eradicated the worries related to the storage space. In fact, it provides extra space for business needs to upgrade computer hardware, which lowers the overall IT Systems cost. Cloud system can be upgraded easily and run in a very short period. It makes development in a quicker way. So it provides the ease of adding a new user in the system instantly by removing the waiting periods. Software integration occurs automatically on cloud. So you have to very keen while choosing the services & applications that would be preferable to your business nature. We can conclude here that cloud has efficiently customized the effort of integration of software and other applications. It has ability to keep you informed about up-to-date versions of software, servers and computer processing powers. The most stunning advantage of cloud computing is rapid development that is its key benefit. Once you pick this method of functioning your whole system will become functional in a few minutes. The exact amount of time taken will be depending on the technology or the structure of the cloud that is being used by your business. The most important advantage of cloud computing is the rise in your business economical graph. The Cloud allows you to monitor all projects more effectively. That is ultimately beneficial to stay within your budget line while completing your project cycle time. This efficiency in work and commitment makes your image stronger in the market, in contrast to your competitors. Happy customers will eventually lead to higher the business economical growth and vise versa. The most amazing feature of cloud is the globalization of work that gives the ease of accessibility. Cloud computing service can be accessed through the plethora of electronic devices that not only includes traditional PC’s but also smart phones, tablets and etc. Bring your own device (BYOD) strategy is easily applicable to a cloud environment. This strategy permits the employees to use their personal devices at workplaces. The end user has been given the choice to select the device and the service, he/she wants to use over the cloud. There is no restriction of position & medium. You can access your application from anywhere in the world anytime, this is the most attractive advantage of cloud computing. Most of the multinational companies are switching to cloud because of this flexibility of accessing work files where ever you are. Cloud computing allows you to monitor all current projects and the previous one effectively. These monitoring features give you the opportunity to fix every issue/ bug on the spot and checked their severity level at once. You easily update or mold your project as per change in requirements of clients. These characteristics permit you to stand alone your budget and project deadline commitments successfully. The most astonishing advantage of cloud applications is that they demand smaller learning curve. And the users can easily use them. Being a new user, you can easily adapt their working and come up with much faster speed. For example: Google Docs and Gmail. The Cloud takes fewer people to do more work. Cloud require minimum learning bend on hardware and software issues. The most remarkable advantage of cloud computing is disaster recovery and backup. Since all data/information is stored on the cloud, so it’s easy to back up or restore the same data on a cloud in distinction to a physical device. Be wise to select a competent Cloud Service Provider that will competent enough to give a warranty of information recovery. According to a research paper 73% knowledge workers collaboratively work with the people in different time zones and regions once in a month. If a company that haven’t switched to cloud yet, workers have to communicate over emails. Only one person can work on a file at one time. So the one file/document has to named, formatted and stored repeatedly. That leads to data duplication and can affect the memory limits. On the other hand cloud computing offers central database location for files. And each employee just works once on one central copy. The Employee can communicate with each other while changing/deleting or updating any file. This feature ultimately boosts the collaborative work environment & brings efficiency in the work. The companies that use cloud computing needs on server space that lower their carbon footprint. Using cloud means 30% less usage of energy and carbon emission than on-site servers. A small organization that is not switched to cloud, their estimated carbon emission is 90%. As made obvious from above, Cloud Computing offers immense advantages to the adopters. On the other hand, it also comes with some problems and we can say disadvantages. Here I’ll discuss only the name of cloud computing disadvantages. Despite of all disadvantages cloud computing is still worthy and have its own bright future. Companies that want to build their own identity should switch to cloud to handle the new challenges of the future. The more you grow the more you will attract. So to offer better, fine tuned solution and services to your valuable customers, go live with a cloud. So we can conclude that cloud technology will prove a great asset for your company. It could harm or behave odd if not understood & taken seriously. We wish that advantages of cloud computing will grow further and disadvantages will be diminished. No doubt cloud computing has given new innovation in IT field. Good Luck Cloud Computing!